Apart from scheduled bus and coach services, The drivers and Coaches from Chelsham Garage was also involved in a considerable amount of private hire work. During 1988 outings included the following destinations, Alfriston, Alton Towers, Ardingly, Bath, Battersea, Beachy Head, Bexhill, Brighton, Broadstairs, Bognor, Calais, Cambridge, Chessington, Dorking, Dover, Eastbourne, Ely, Harwich, Hastings, Huntingdon, Kingston, London, London Zoo, Littlehampton, Margate, Oxford, Poole, Rochester, Southsea, Sundridge Park, Thames Barrier, Thorpe Park and Windsor Safari Park. ANY CHANCE OF HIRING A COACH TO SNOWDONIA? 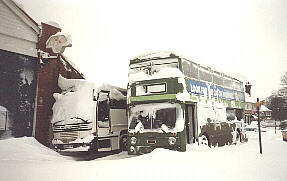 This scene taken during January 1987 shows AN 300 and DTL 655 standing outside a very snowbound Chelsham Garage. The B269 Limpsfield Road across Worms Heath and Botley Hill towards Tatsfield was blocked by snow drifts and remained closed for over a week.